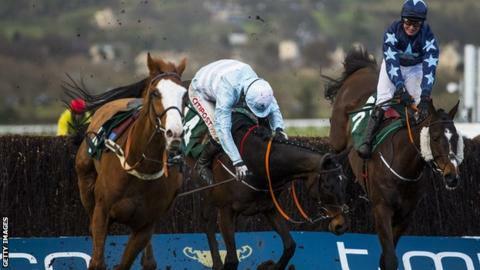 The British Horseracing Authority (BHA) will carry out a review after six horses died at the four-day Cheltenham Festival. Four horses had to be put down on Friday's final day of racing. Sandsend, ridden by Katie Walsh, was put down after suffering a leg injury during the County Hurdle. Three more horses - Dresden, Some Plan and North Hill Harvey - suffered fatal injuries in the concluding Grand Annual Chase. Jamie Stier, chief regulatory officer for the BHA, said: "Everyone who follows this sport does so because we love these fine animals and it is extremely sad when we lose any horse. "We will also be examining whether the existing penalties for misuse of the whip, and how they apply, constitute an adequate deterrent to jockeys. "We continue to use research, safety measures, regulation and education to reduce fatality rates to as close to zero as possible." Earlier in the week, Mossback and Report to Base had to be put down after running in the National Hunt Chase and Close Brothers Novices' Chase respectively. The welfare advisor to the BHA said it was "extremely relieved" the organisation had "heeded our calls and pledged to undertake a detailed review of the festival". "None of these fatalities can be accepted as a by-product of the sport," World Horse Welfare said. "We acknowledge that racing will never be risk-free, but it is vital that any fatality is fully investigated and that wherever steps are taken to reduce the likelihood of such tragedies occurring. "We look forward to playing a part in this vitally important [review] process, which made such a difference to the safety of horses at the Grand National when they undertook a similar process." The RSPCA said: "The fatalities are extremely concerning and it is essential that the announced review by the racing industry must be completely comprehensive to reduce the likelihood of such tragedies occurring again. "A review was carried out at Aintree in 2012 which has since reduced horse falls, injuries and fatalities."